Peppermint and chocolate is one of my favorite flavor combinations. 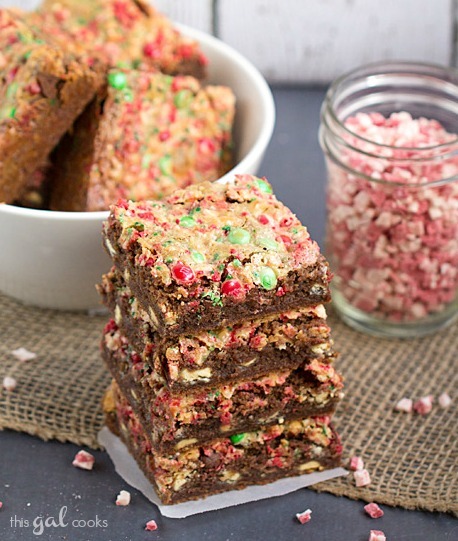 Get the best of both with these Mocha Peppermint Cookie Bars. Well folks, there you have it. My first Christmas-esque recipe of the season. Despite vowing to not bake Christmas goodies until after Thanksgiving, these somehow made it out of my oven before Thanksgiving. But I’m not complaining. And neither are my fellow co-workers. And neither is Ken. These were a huge hit with everyone. They taste amazing topped with vanilla ice cream. Mocha. Peppermint. Cookie. Mmm. That does go good with vanilla ice cream! The breaking of my Christmas baking vows all began with an impromptu trip to Wal-Mart. Cough Cough. That doesn’t happen too often but it was early. Wal-Mart wasn’t yet filled with hoards of zombies people so I figured why not? I stumbled upon some sweet baking goods (no pun intended) while browsing the isles of the food section. Mini M&Ms and Andes Peppermint Chips. This gal cannot resist fun baking accessories like that. So I quietly snuck them into my cart and went on my way. Ah fine. Who am I kidding. No sneaking involved with these. When I found Ken wandering in the video game section of the store, I was like yo, check out this sweet stash of baking goodies I just found. Psst, I didn’t really say it in those exact words. I just replayed the scenario in my head like that. But you get the picture, right? I had a little fun with photography on the day I made the cookie bars. For the base of these bars, I made a chocolate cookie crust that was adapted from the Williams Sonoma Baking Cookbook. I doubled the recipe, replaced the vanilla extract with coffee extract and added white chocolate chips to the dough. After pressing the dough into a baking pan, I baked it for a few minutes and then went to town topping it with a variety of toppings. I baked it again until bubbly and then I enjoyed Mocha Peppermint Cookie Bars. I hope you enjoy them too! Using the double boiler method, melt the chocolate. I don't have a double boiler so I filled a sauce pan with some water and then place a hefty glass bowl over top of it and melted the chocolate in the glass bowl. 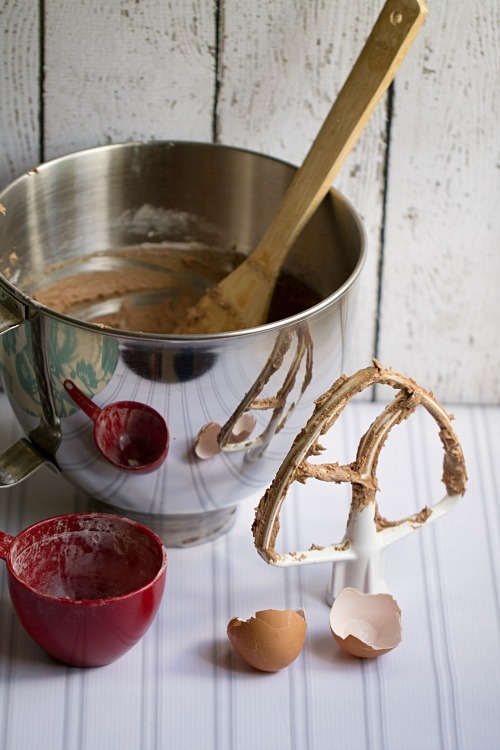 In the bowl of a stand mixer, beat together the butter, shortening and sugars on medium speed until blended. Beat in the melted chocolate, egg and coffee extract until the mixture is smooth. Beat in the flour mixture until just combined. Stir in the white chocolate chips. Press into the parchment lined baking sheet and bake at 350 for 15-20 minutes. Do not bake it all the way. 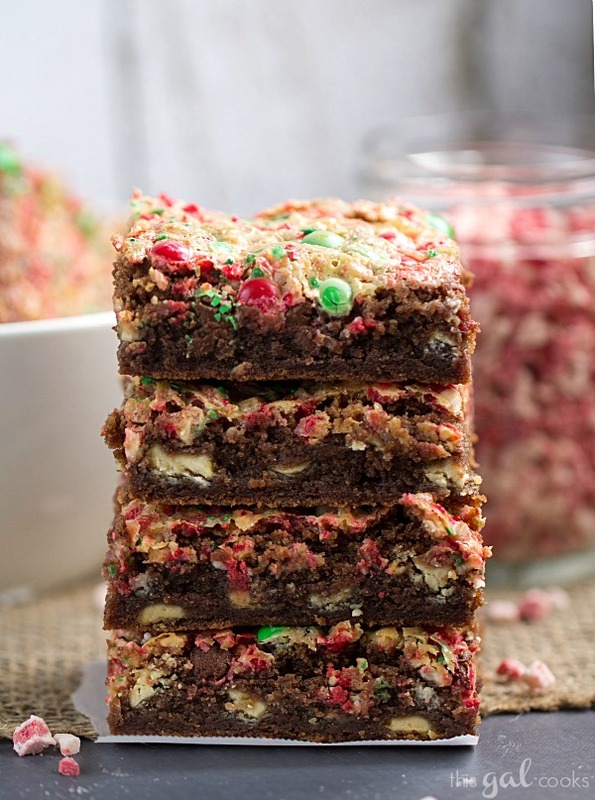 Remove from the oven and top with the peppermint chips, M&Ms, sprinkles and then pour over the sweetened condensed milk. Add a few more sprinkles, if desired. Bake at 350 for another 20-25 minutes or until bubbly. Cool completely and then lift out of the baking ban and cut into squares. I am obsessed with those Andes baking chips! I have already gone through a bag and need to get more! these look great Julie! A perfect intro into holiday baking!! So festive! I am obsessed with peppermint and mocha and as much as I tried waiting until after Thanksgiving before breaking into the mints I caved the week before Thanksgiving as well. I am so glad you did too because these bars are beautiful and everything the winters should be made of! I sure wouldn’t mind a few of these floating around my office either! Mmm, gotta love office treats! I just can’t get enough of those peppermint chips this year! These bars are so crazy good looking!!! These cookies look amazing! Peppermint Mochas are my favorite holiday drink, so this recipe is perfect! Pinning for later, thanks for sharing! Such a perfect treat for the holidays!! Thanks for sharing with us at the Share the Wealth Sunday link up!! Those look wonderful Julie! I had to tweet and G+ share them :-) Thanks for sharing this with us at the DI & DI Link party. Hope you had fun, and have a great weekend! Pingback: Great Ideas -- 17 Perfect Peppermint Ideas! These sound delish! Thanks for linking up with Funtastic Friday! 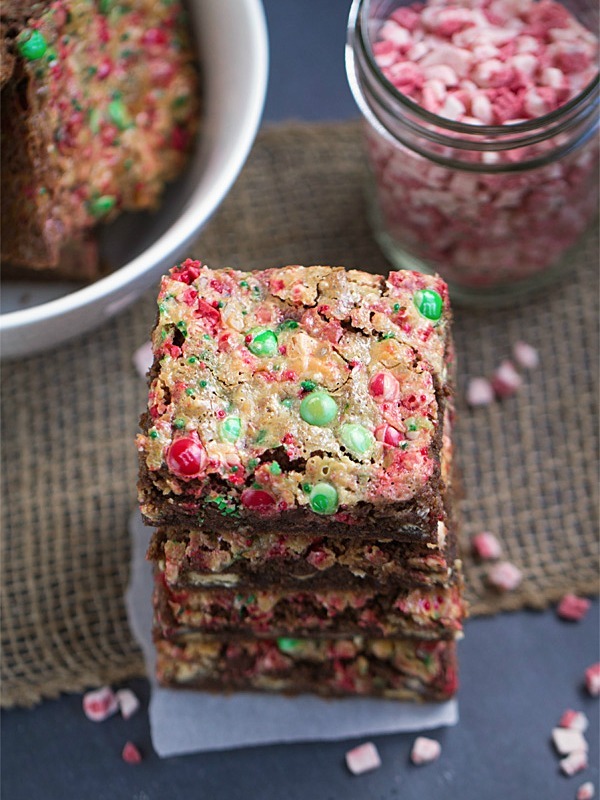 I just pinned y our fabulous Mocha Peppermint Cookie Bars, can’t wait to try them! I really appreciate you sharing with us at Full Plate Thursday. Hope you have a great week and come back soon! These sound amazing! Thanks for sharing with us at Funtastic Friday…I have chosen this post to be featured as one of my favorites on this coming Friday’s Funtastic Friday!